Have I mentioned yet this summer how much I hate hot weather? Well, if not, here ya go: I hate it!!!!! Over all this summer has been decent but we get these spells where it's just unbearable. Yesterday was 108, today was close to that. It barely gets below 80 at night, so nothing really cools off. It was so hot last night I didn't fall asleep til almost 3am (the mosquito in my room wasn't helping matters). Bleh! Almost lost one of the big chickens today to the heat. 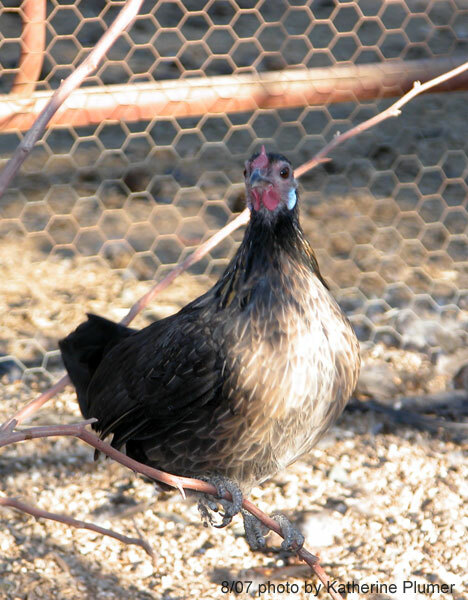 The bantams take it pretty well but the big girls suffer. Luckily I got to her in time and ran cold water all over her until she was able to stand and her expression returned to that of a normal (although hot) chicken. Everything is lethargic, including me! This'll put a damper on my normal "spend the whole day at the fair" plans. Yuck, I'll be lucky to make it til lunchtime before I give up and come home. Oh well, I guess the only requirements are that I get the birds in and have a cinnamon roll! ;-) (Some traditions cannot be messed with). Anyway, not much to say really. I'm working on experimental stuff with scrimshaw but it's not anything fun to look at, I'm just trying out different inks and paints and learning about drying times and sealants and blah blah. I think I'll order some micarta and see what I think of working on that, so that in the future I can tell people whether or not I like it. Oops, almost forgot to post these. did the blue part today. The drying time makes me impatient, I may switch over to water-miscible oil paints instead to try to shorten that. Otherwise people will have to wait ages for me to do this stuff just because the paint is slow to dry! Again, this one might not work. We'll see. The craziest month of the year is about to start. I haven't gotten word about the Chicken Festival yet, I think I will email them. If I'm in, I need to get crackin. Heck, I need to start prepping for Draft Horse Classic! 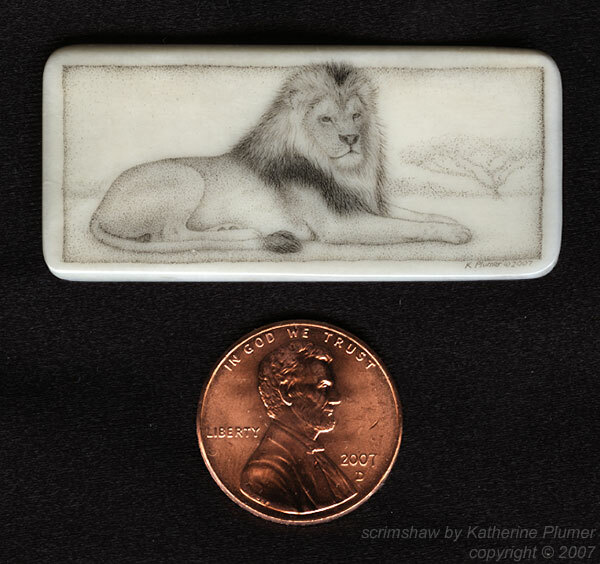 I'm really into this scrimshaw stuff now, I think my art biz is going to make a big change in direction.... I posted some work on an engraving forum and got really good responses, and I just posted some work on a knifemakers forum. Keep your fingers crossed. I'm working on the lion-in-color and it's going okay but I'm running into some problems for which I need to find solutions. Putting multiple colors onto one piece is definitely leading to some "color pollution." I had tried to seal off the white layer with a couple coats of paste wax but the sky blue is filling into the white areas a little. I can see that working dark to light would help solve this, but I just don't think in terms of dark to light! So I've been asking around to see what others do and will probably have to do a fair amount of experimenting. Maybe just more layers of wax (it's so thin you'd never know it's there at all). I got word the other day that the local art club is looking into opening a gallery in town. That's great news but they want a yearlong committment, and I can't take that risk. In the worse case scenario, if nothing sold, I'd be out $1450 over the course of a year. Noooooo. If it was a shorter committment, three months maybe, I'd consider it. Or if I was sure my stuff would sell.. But, I'm just not convinced that my stuff is going to sell locally, I don't think it's the right market. I hope they are able to get the building though and I hope it works out for other people. I don't know if anyone has noticed that I neved finished up that digital image that I said I was going to do with the Light Brown Leghorn... There are a lot of loose ends. I start series of work but find they don't yield much of anything, and then they fizzle. The Wakeup Call turned out great, that one came pretty easily to me. But the rest of them have not. I love love love love love drawing the chickens, I'm not so thrilled with creating digital backgrounds, it just feels like I'm overworking these somewhat minimalist illustrations, and I have a tough time with that. Plus I don't know what the heck I'm doing in that market, and I think what I'm realizing is that I myself really am not cut out for dealing with the "mass market." I was send off down that path but I don't know where to go from here, and maybe that's not the best place for me. If I want to pursue that, I think the bottom line is that I would need an agent. And that might ultimately be very successful for me. 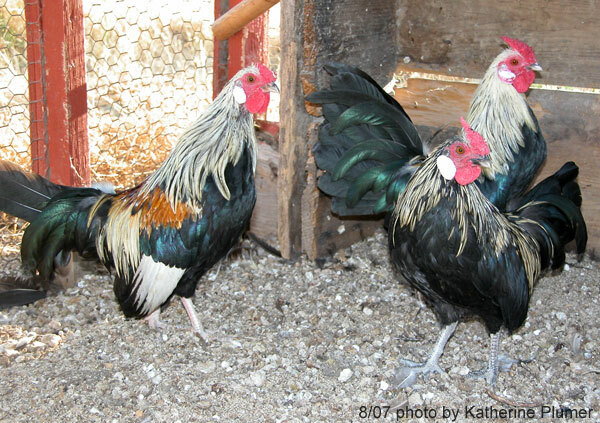 I spent much of the morning sorting through all the young roosters. It was time to separate them from the girls, so they don't pick at each other, and also the boys are more mellow if they don't have girls around to fight over! I saw some birds that make me really happy, and also some birds that really disappoint me. There will be another round of culling, but the potentially good cockerels are as follows: 9 BBRed (wow! ), 3 Black (that's terrible! That means I will hardly have anything to sell), 4 Brassy Back, 0 Blue Brassy Back (sigh). 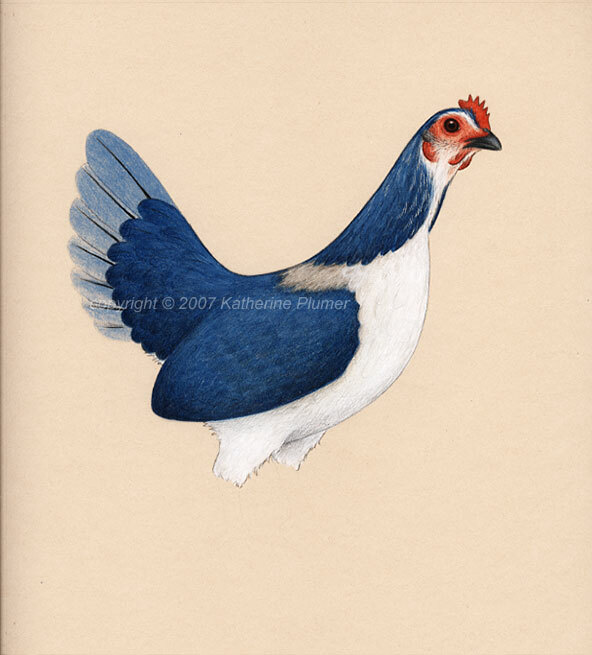 The Blue Brassies had a lot of color faults... buff coloration in the chest. That's a frequent problem with them, but I am dismayed that none of them turned out good. 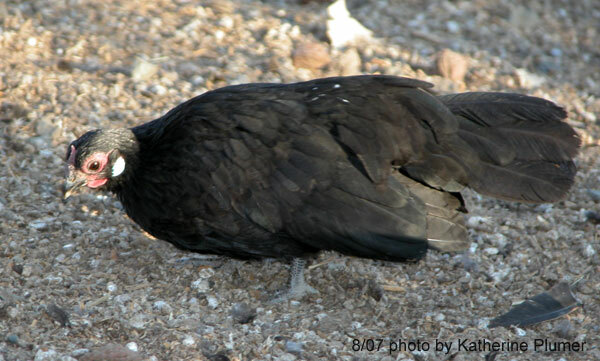 I knew it was a little dicey this year though since the male I used in the breeding pen was genetically purebred black. 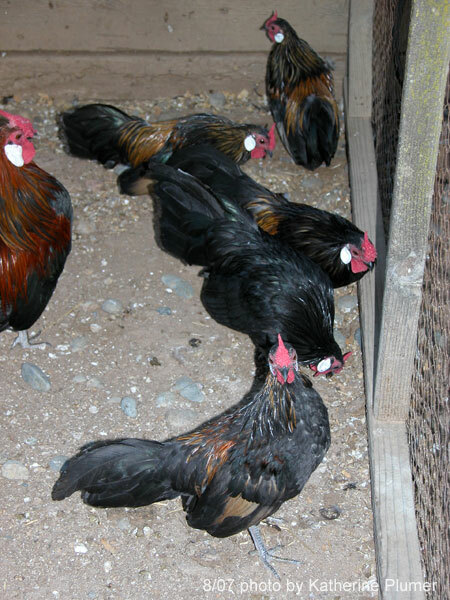 Looks like a lot of the Brassy and Blue Brassy Back pullets will be too dark. I AM convinced it's possible to get light-chested females and dark-chested males from the same breeding though. It's way too soon to say what I have for sale, if anyone is interested. 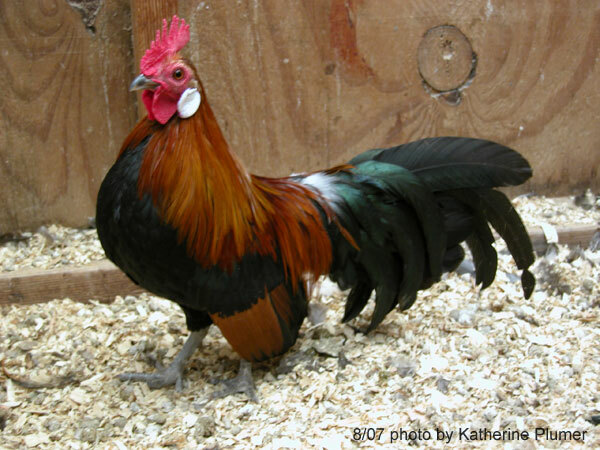 I won't sell males til they are fully feathered out (in case they don't grow a full tail.. it happens). I sold the Cuckoos a couple of weeks ago. I don't miss them. Sometimes I'm tempted to only work with the BBReds... but I can't do it. I took some pics today. 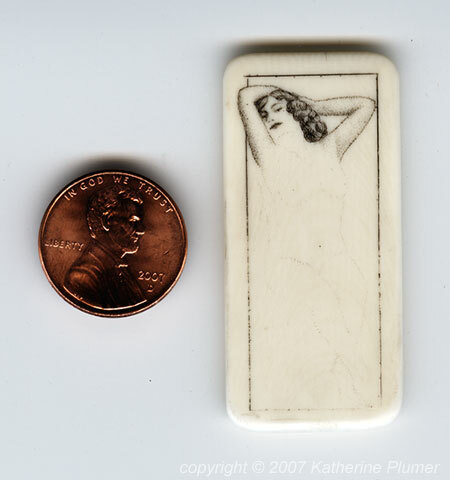 But on a related note, I am taking commissions for b/w scrimshaw (or any single color image). 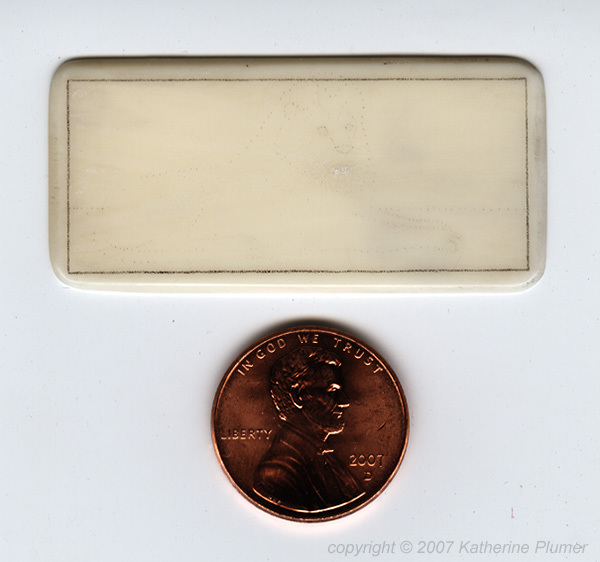 I do not have the tools to slab ivory or do extensive polishing, but I can purchase ivory blanks for jewelry, buckles, etc. Contact me for details, and I'll be putting info on the main site soon. This is a practice piece I did so I could see exactly how long this takes. I chose an image fairly mid-range in tone with a bit of background to cover the whole surface. I will now do the same image in full color, in order to see how much longer that takes (so that I'll know how to price color work). Scrim time got cut a bit short today because the electricity went out... makes it hard to see what I'm doing when the room goes pitch black! By the time it came back on it was time to head back home anyway. OMG, it's such a slow process! (so obviously the short horse should have been photographed closest to the camera...lol). On the left is me and Shylah. Middle is Neva and Dusty. Right is Wendy and Blue Top. (I know, sometimes I use initials and sometimes I don't, there's really no rhyme or reason to it). ...which was very nicely presented. I didn't know anyone and nobody I knew came to visit. I didn't realize it was going to be judged. Best in Show! Woo hoo yeah! 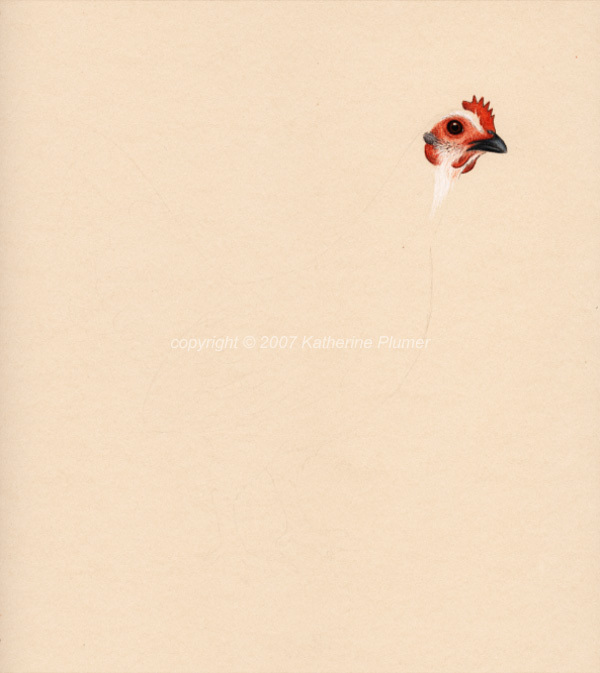 That was with the Light Brown Leghorn drawing. Second place with the Silver Phoenix lithograph. So I made enough $ to cover the entry fees with a couple bucks leftover. I forgot to bring a camera. I also forgot to bring the wedding gift. I would forget my head if it wasn't attached. 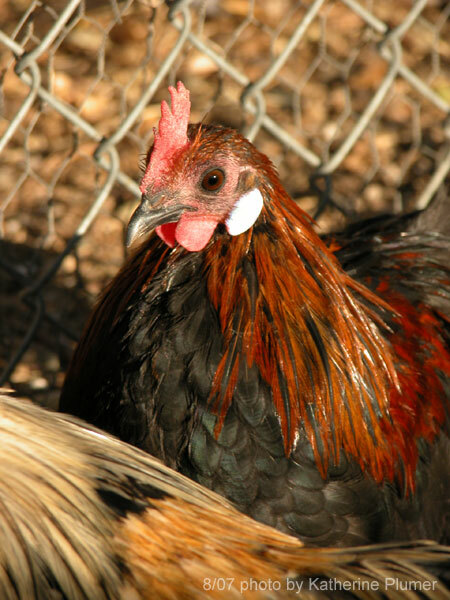 Ha ha ha, this is REALLY weird to be using these colors on a chicken. Some of these blues are brand new never been used! So I need to put it down in writing that I've been referring to this as the "Fantasy Fowl" series. 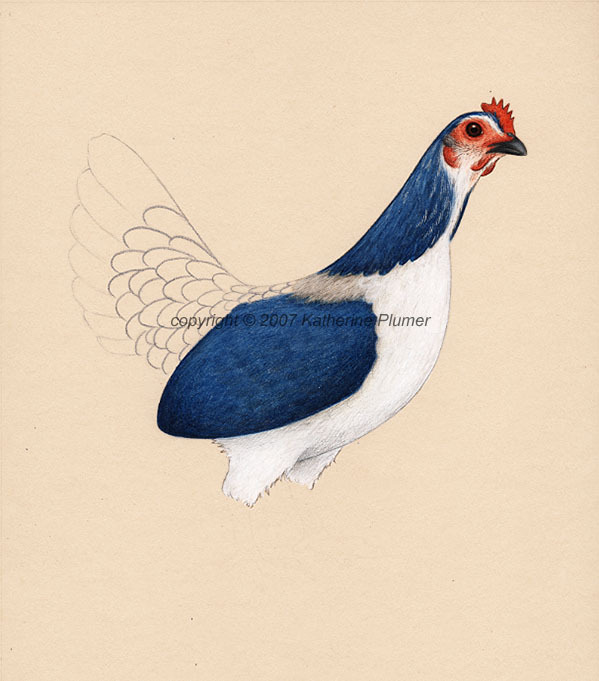 (at some point I'm going to break up the chicken art on the website to reflect this, since things seems to happen in series... head studies, Standard drawings, game fowl, etc.) The reasoning behind what I'm doing... well, it's complex. 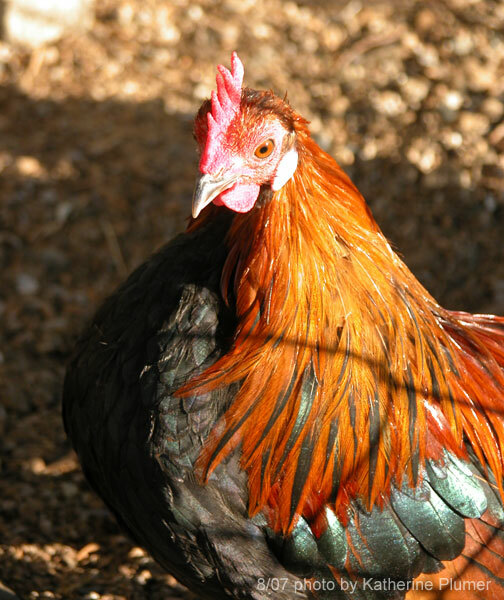 Chickens really do come in some fantastic colors on the own. I spent 2.5 years drawing them. I am entralled with drawing chickens, but I wanted more diversity of color, I wanted to get away from the Standard while still staying true to this drawing technique that I love so much. So the challenge is to take colors that DO NOT exist in chickens, and get these drawn birds to CONVINCINGLY wear these color patterns. Some will be wild bird colors (the red tailed hawk, the bald eagle, etc). Some will just be made up pretty stuff. 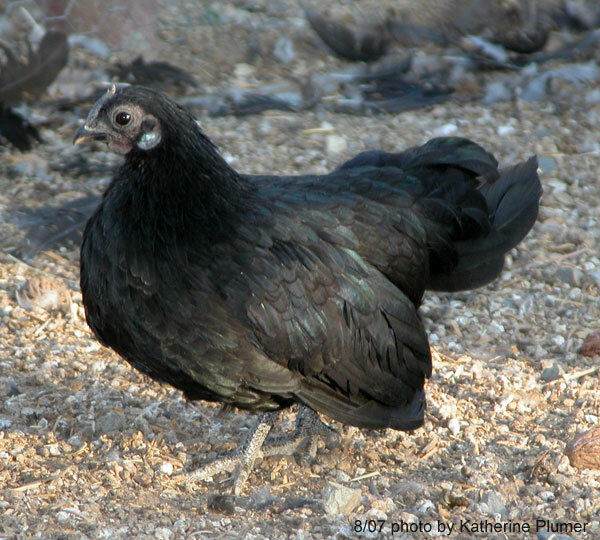 My fellow chicken snobs will know what is and isn't a "chicken color." And of course it's a perk if someone recognizes what the color really is. But the goal is just to make it look real, when in fact it never could be. 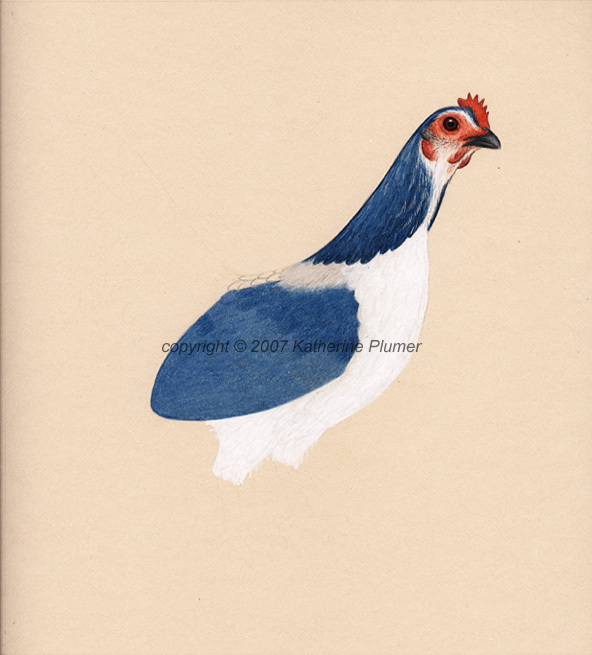 Remember, tomorrow evening is the opening reception for the chicken art show in Fair Oaks! (details are a few postings back). I will be there after about 6:30pm. Come visit me! This evening was the awards ceremony for the State Fair Fine Art show. This was the first time I've gone. It was okay, there were a lot of people there. Wasn't as formal as I had thought (only the "big awards" were announced). I saw a few familiar faces, including someone I hadn't seen for 6 years (who remembered me!). 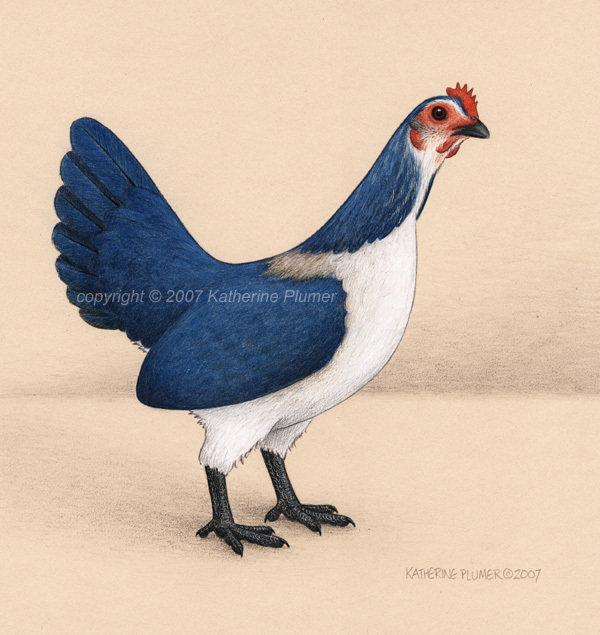 I started the color work on the blue chicken today. My sincerest apologies to those who wanted yellow beak and legs, I just couldn't do it. I think you'll like what this turns into though. Goes with the recent theme. 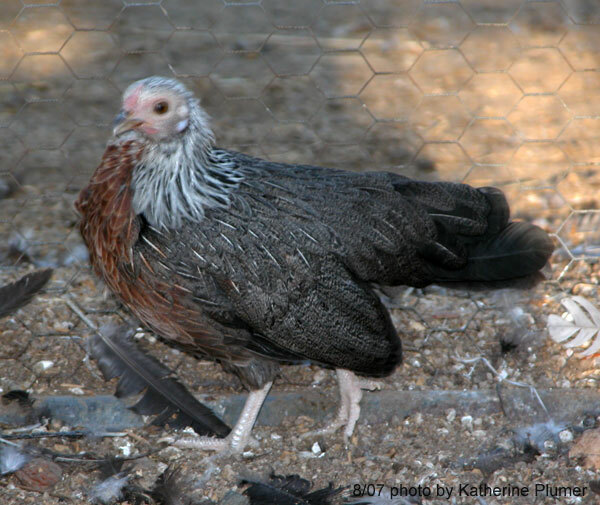 I WILL do a yellow-legged blue chicken though (on a breed where that leg color is appropriate, like a Wyandotte or a Rock or something). OMG I'm an idiot! I scanned the sketch backwards and now she's facing the other direction. Lol. Oh well. I spent many hours at the scope today. Ugh, sore hand... But the good news is it's finished! Woo hoo! I hereby declare myself officially nuts about scrimshaw. Not sure what will be next. I would like to do some more practice piano keys. I enjoyed the figure drawing! At some point I will give color scrim a whirl too but I'd like to stick with single color right now while I'm still getting a grip on the technique. I spent another couple hours hunched over the microscope today. I am definitely learning what features I would like to have in my own scope some day. Longer focal length so I can sit straighter and have more working room under the lens (I keep burning my hand on the light!). And being able to work in air conditioning will be nice. It's usually pretty cool in there but today it was hot. But some random ramblings first. I got the check from the poultry auction today. Pathetic. Came out to $1 per bird after they took their commission. Needless to say I won't be going there again. It was lovely to get an extra hour of sleep and not spend an hour and a half driving, but I could have gotten probably at least three times that amount if I'd gone to Roseville instead. Poopy doo. I picked the last of the peaches and plums today. Gotta do something with them tomorrow before they all spoil. I shall miss them. Okay, now on to art stuff..
Help me pick a color for this. I thought it would be fun to be kinda interactive with this one. Suggest anything. 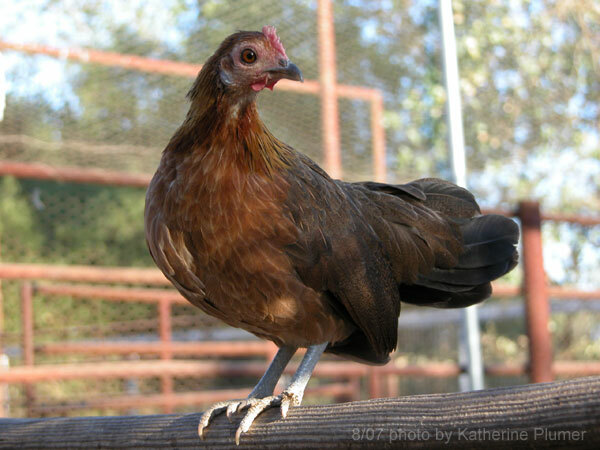 A real chicken color, a crazy impossible chicken color, a wild bird color, anything. 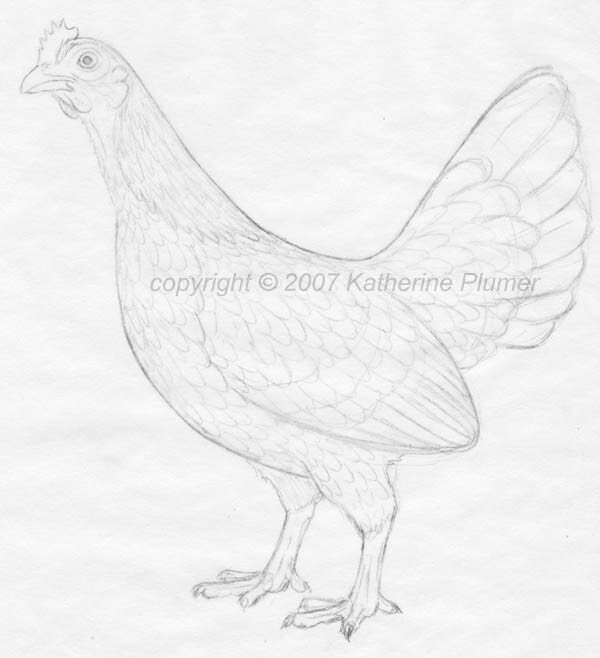 I may or may not use anyone's suggestions, but I have drawn so many "real" chickens I just would rather do something different. If nobody comes up with something I like better (yes, I am picky!) 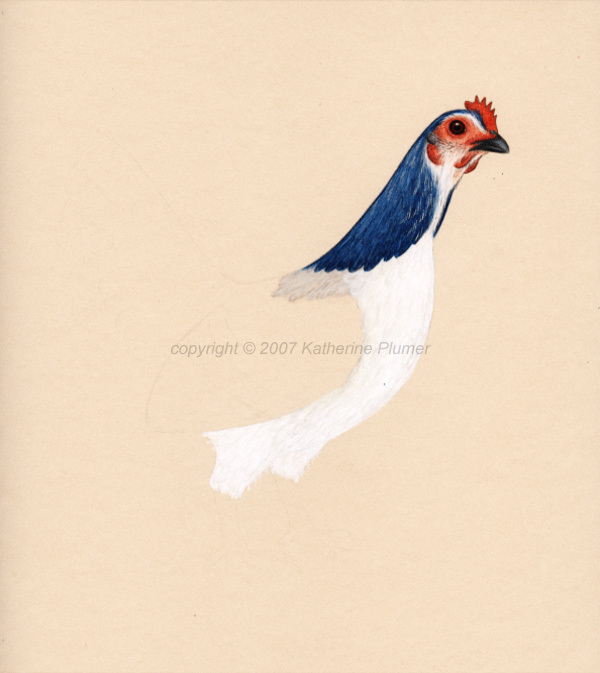 then she shall be White Spangled Red. And then there's this one, another practice piano key. It won't be perfect but I thought I'd show you the WIPs and entertain you anyway. This is based on a vintage photograph (early 1900s). Since this is evidently a popular subject for scrim I thought I'd better do some practice... haven't done figure drawing for a while. 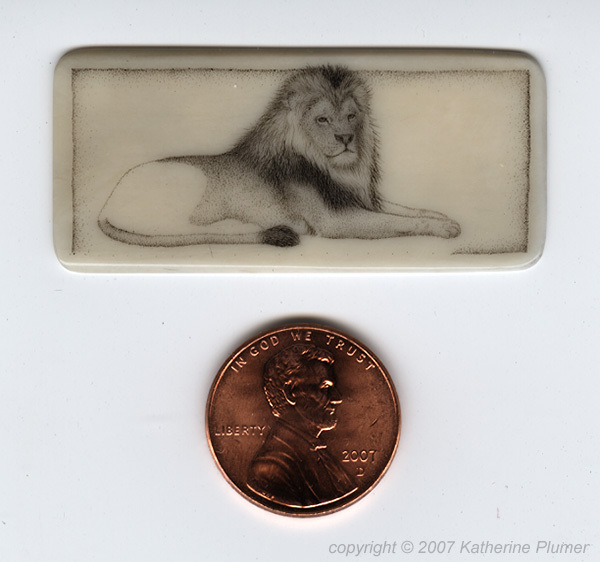 A friend of mine who is an extraordinarily talented engraver recently suggested to me that I try making some scrimshaw. I knew nothing about it, but jumped right on it, and OMG, I think this could become an obession. 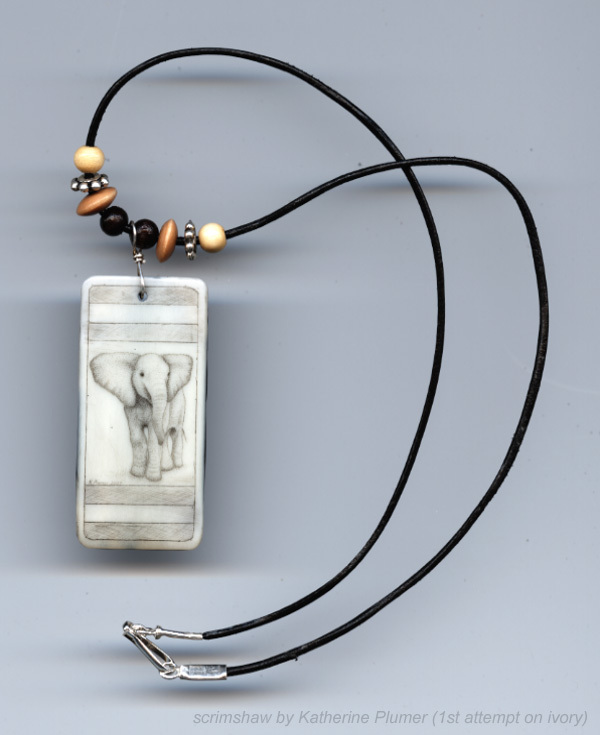 I ordered a new scribe tool, a DVD, a book, some ivory, and a few other odds and ends, and set to work learning. I've done pen and ink stippling, which is helpful. And I've done drypoint etching, which is more helpful. 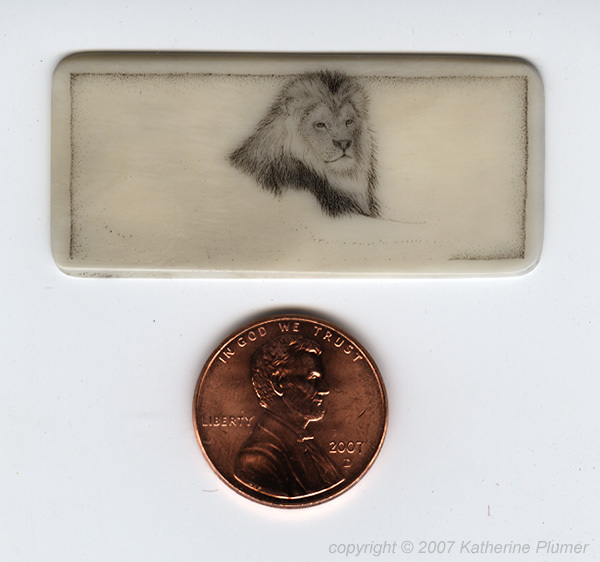 Scrimshaw is incising ivory (or plastic, bone, synthetics) and filling those lines/holes/scratches with ink/paint. Impatient for my goodies to arrive, I did a "spoonshaw" a little over a week ago. 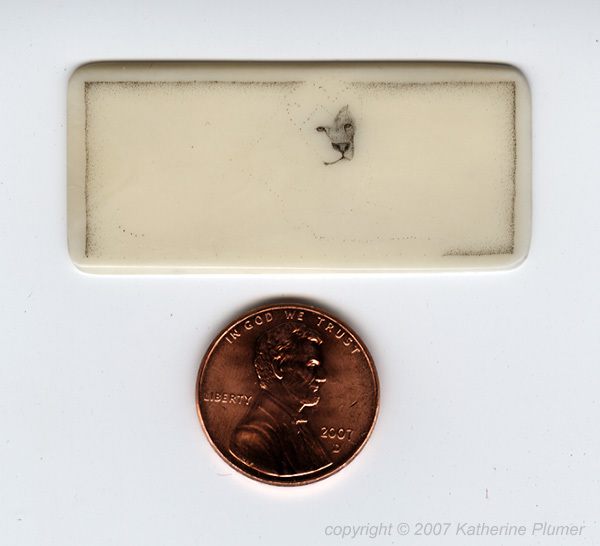 This was done with a fairly dull etching scribe (less sharp = larger dot size) with 0-1.5X magnification, on the back of a plastic spoon. The spoon was done using an old optivisor (1.5X) some of the time, and nothing when I got tired of wearing that thing. I later tried using a ~2X magnifying lamp, but it was so hard to get the image lined up just right so that I could see what I was doing. The pros use stereo microscopes. That's well out of budget right now but to my great delight I learned that my neighbors have one! 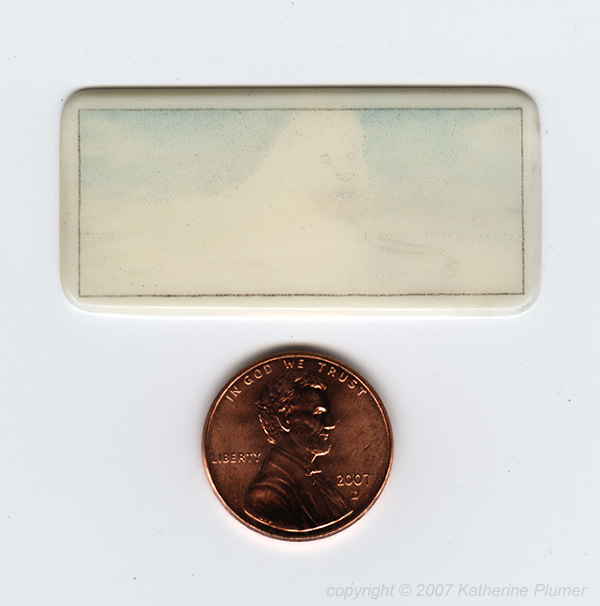 So the next piece (the elephant) was done at 10X on a scope. WOW it's weird to work at high magnification! But it's necessary, there is no way to get the fine dots and fine detail with the naked eye. 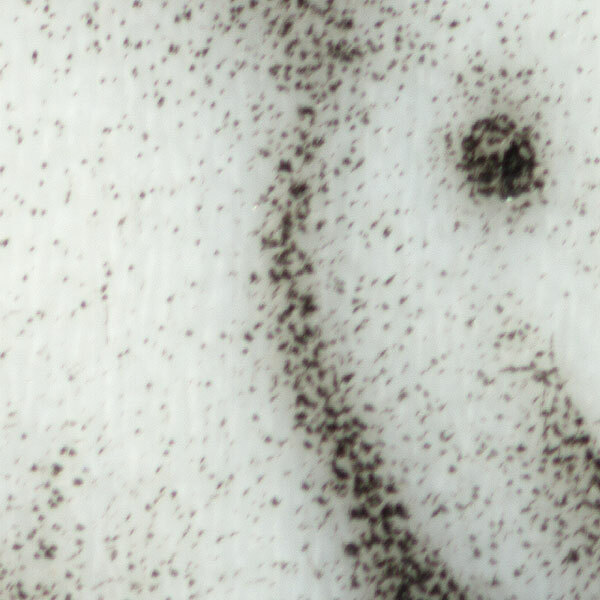 Under the 2X lamp, I thought I had areas solid black, but under the 10X scope, I could see more white between the dots than dots themselves! In time if this works out I plan to get my own setup but for now this is incredibly awesome to be able to use theirs. I finally got all my stuff, and proceeded to really mess up my first attempt on ivory (pre-ban piano keys, if you are wondering). The elephant figure itself turned out pretty good but I made some big mistakes on this piece. I'm going to post it anyway but I must say it's not a good piece, I did a lot of experimenting with different techniques and did some damage along the way. But I learned, oh I learned... I'll just keep this one, or give it away or something, can't sell work that's not up to snuff. I will do a few more practice pieces before I try to sell anything. But.. this has some potential I think. I like it! Come visit me at either reception if you get a chance, I'd love to see some familiar faces! I am also applying for a booth at the FAIR OAKS CHICKEN FESTIVAL, September 15th. More info: http://www.fairoakschickenfestival.com I won't know for a few weeks whether I am juried in or not. That's an outdoor festival. I'll post more info if I get in. 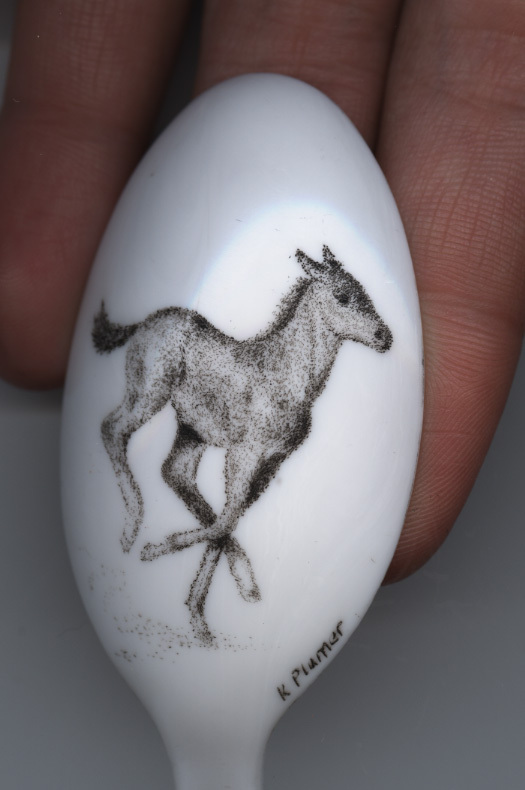 An early art show notice.... Love horses? How bout tractors and art and old timey music and great cinnamon rolls? Then you need to come see me at the Draft Horse Classic! It is located at the Nevada County Fairgrounds in Grass Valley, CA. This is my sixth year participating. I just love this show! I have three pieces in the art show and will have a 10x10 booth full of art for sale. There isn't a lot of excitement to report, which is why I haven't been reporting it. I've been up to my ears in peaches (they are huge! 1/2 pound each and OMG so good!). 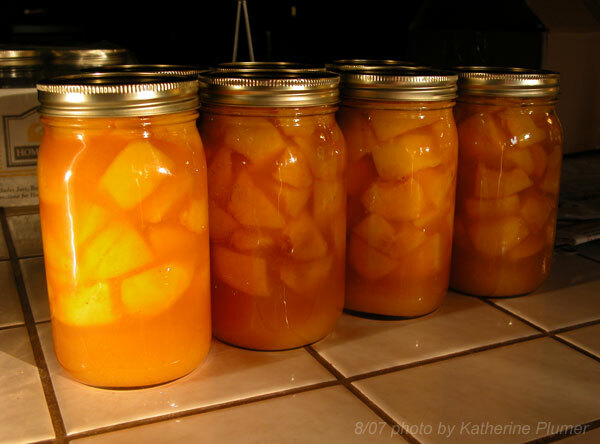 Pureed peaches, dried peaches, canned peaches. It's just been peachy. Here's what I did today, this'll be great in mid winter! Shylah is doing wonderfully well on trail rides at JJ's. Other than the first time I've just been riding alone. She's had some of those "stupid moments" but overall great, and is pretty consistently jumping a small irrigation ditch that crosses a road (well, as long as she's headed "home"!) I'll see about getting her back home in another week, and then a week after that she'll be off for adventures with JC in the land of bears and boulders. I WILL miss her, not seeing her for a month, but September is so crazy for me anyway it's really just as well. I am about half done with a practice piece for an entirely new art venture (this thing I keep dropping hints about). I already love it but can see that it is something I don't want to do for more than maybe two hours a day (will explain all this later!) ;-) I've made some mistakes on the practice piece, so it's a good thing nobody is paying me yet. I have also learned a LOT. Pics and explanations in a few days, assuming I don't screw it up between now and then. I am taking 50+ birds to auction tomorrow. YAY!!!! There is a new auction just a few miles away. Double yay! That'll beat the heck out of driving to Roseville. 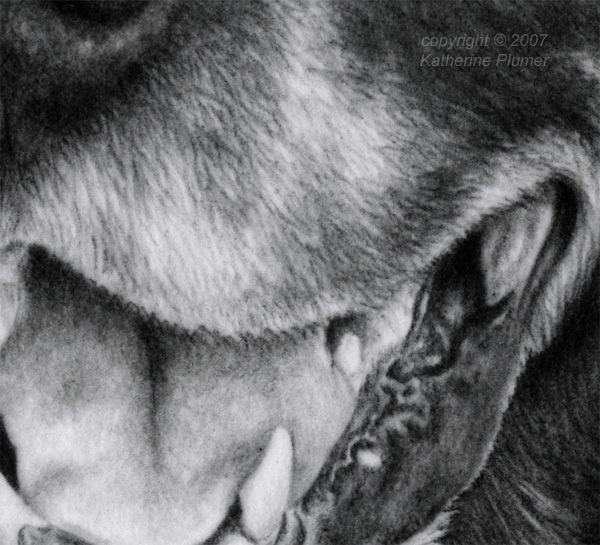 This is just a detail view to try to convey the softness of this paper, it's yummy. I keep forgetting to post this, it's a photo from the first ride over at JJ's. Me and Shylah are in the back. W (sidesaddle!) and Blue Top in the middle. NV and Dusty in the front. Where to start? It was a busy weekend. I had the place to myself, which led me to do silly things like sleep outside in the hammock at night (brrrr! I was glad Homer the cat curled up on my feet this morning! ), and eat pancakes for dinner. Why? I dunno, why not. Aside from starting (and finishing) Harry Potter 7 (I will not say a word about it!) it was a weekend of working around the house, and primarily working in the kitchen. There were approximately 9834984509092 ripe nectarines (okay, slight exaggeration), so I made jam (and strawberry jam too, Saturday was very jammy) and a bunch of pie fillings, tried to bake nectarine bread but it failed miserably (darn random internet recipes!). A very fruity weekend. 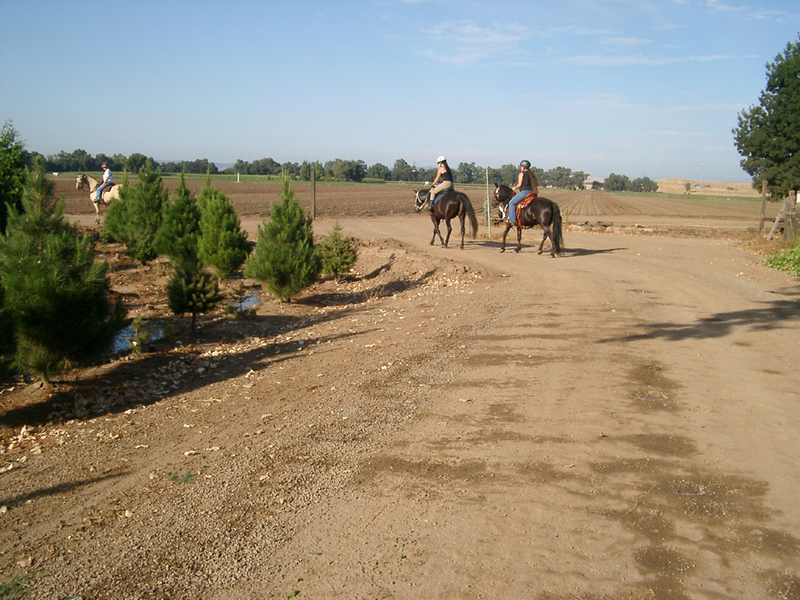 I rode Shylah for about an hour and a half, maybe a bit longer than that, on Saturday morning out at JJ's. Just me and Shylah on the trails and levees. She was GREAT. A few minor stupid moments but all in all super good. I think she enjoys going through the parking lot at the corn stand, she seems to love the attention! I miss having Shylah here and seeing her every day (of course I still get to see Gwen every day, but Gwen's not as happy to see me as Shylah is!) but I'm REALLY going to miss riding out there when Shylah comes home. To get anywhere from here I have to ride on the road. Hopefully after this Shylah will be a lot better about cars but being out there on the levees reminds of a lot of the old days with Thunder back on the big ranch, and I sure do miss those river rides. No art updates, I didn't have time to make art this weekend, but it'll be back to regularly scheduled art updates soon! I don't regret missing the re-onion, but I know there were people I would have liked to have seen.... C'est la vie. I guess if they wanted to see me too it would happen. Boring post, I know it. Over and out. Okay, anyone who is interested in home-made jam, stake your claim now! $5 per (8oz.) jar. I'll ship it if you pay for shipping. PEACH: if anyone's interested let me know asap, they are ripe! Getting there... Once the rest of that blank spot is done I will still need to adjust it a bit.. some of the mid range grays need to be darker, it's just often hard to see that until the whole thing is done! 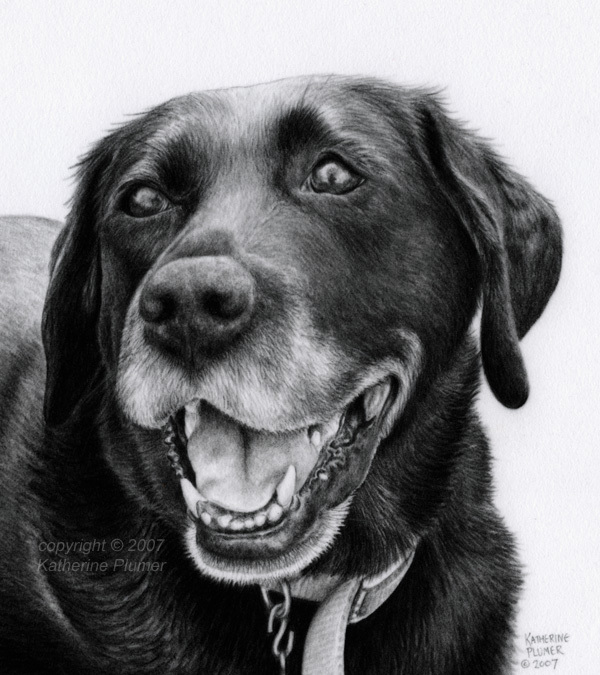 I'm glad I'm doing this piece, not just because it's a portrait of Jessie and something I've been wanting to do, but I'd been wondering if I was overcharging for graphite. OMG, NO. It really is only slightly less time consuming than colored pencil! 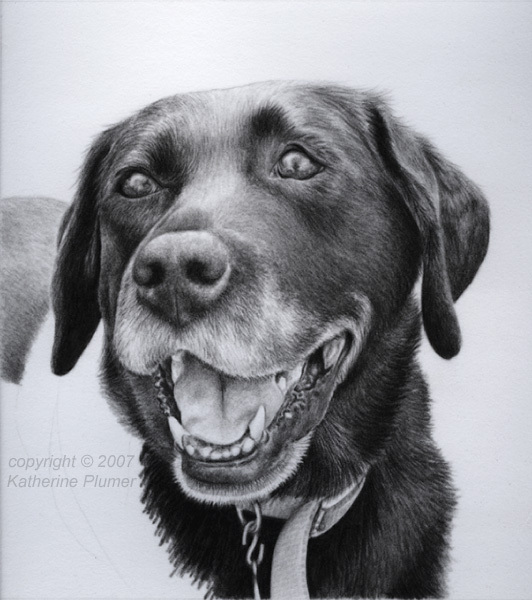 So it's good to know I'm right on track, I hadn't done any graphite work for a couple of years. I still love it! And this paper, wow, scrumptious! I wish you could see how lush this is. When I do the final scan I'll do some detail shots. I rode Shylah at JJ's this evening. W rode Blue Top and J's friend NY rode Dusty. All were well behaved, but poor short Shylah just can't keep up with those Tennessee Walker boys and their huge strides. She was hustling but lagged way behind. Her two biggest spooky moments (which were incredibly small) were when Blue Top stepped on a crunchy bunch of leaves, and when Dusty spooked at a barrel, and Shylah spooked at Dusty spooking! Silly horses. I am still trying to figure out when to ride this weekend, and how often. I do love evenings, but morning means there's no time at which I have to be back! Guess it may depend if anyone goes with me. Saturday evening is the high school reunion, which will not be graced with my presence. I'd thought about attending a bbq instead but the one person I know well is involved in running it, sooo.... hmm, go riding or have a quiet evening to myself. :-) Then again I'm still debating going to the bbq anyway, durn, I feel a bit pathetic not doing anything (it's like missing prom!) Hmmmm (anyone want to go to a bbq Sat eve? ).